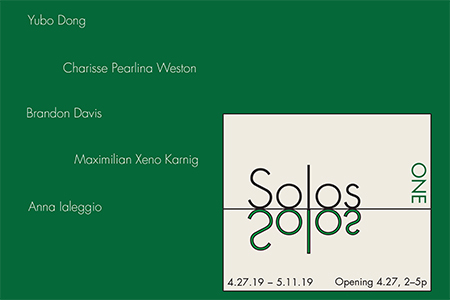 The Department of Art at the University of California, Irvine is pleased to present the solo exhibitions of MFA candidates Maximilian Karnig, Charisse Pearlina Weston, Yubo Dong, Brandon Davis, and Anna Ialeggio. Please join us for the opening reception on Saturday, April 27th from 2–5pm. “Dogskull, dogsniff, eyes on the ground, moves to one great goal. Ah, poor dogsbody. Here lies poor dogsbody’s body. Bottle caps, a dog’s arse, a curtain, a thread, and other mythological matter reverberate as mediating forms between phenomena and ideas within a series of simulacral traps. Borrowed forms, like words, are rearranged and re-performed to ultimately conceal what they wish to present. In various degrees of expressionistic diversions, a self-apparent lie presents a proposition of truth. Within these poetic games, themes of literary tradition, banality, baseness, humor, and absurdity draw upon the illusory aesthetic tools of engagement that are never new, but perpetually enact a rebirth seen here in an exhibition of eleven oil paintings. How do you hold a fugitive dream? How do you know you are free? What is doing evil? What is the right thing to do? What is keeping you busy? What is making you bored? Are they intelligent? Are they trying to help you? Are they making you a better person? Are they emancipating you from misery? What are you, and who are they? This group of work is derived from the observation of massive data collection practices by Silicon Valley firms, and proposes a series of questions to rethink the question: What is the role of technology users in the supply chain of the new paradigm of business transactions? A dwindling, a shrinking of options, a decay in millions of decisions. Does the organism decide? Or does the environment decree? My pants are too tight for this. Wait, let me take off my sweater. … fleeing these intimacies, the ghosts of membranes and thresholds.